UPDATED: LG's 15in OLED TV will go on sale this month | What Hi-Fi? The 15EL9500 is just 3mm deep with a staggering 10,000,000:1 claimed contrast ratio. LG also claims the set is more energy efficienct, at 40 watts, than existing sets and offers wide viewing angles. It's a 1366 x 768 resolution, HD-Ready screen, with a digital Freeview tuner, 100Hz motion processing and a USB 2.0 input for movies, music and pictures. Set to go on sale this month, it will set you back around £2000. 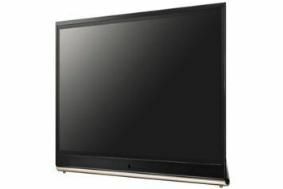 While Sony recently announced that it's putting plans for OLED TV development on hold, and concentrating instead on returning its display business to profitablity, Korean rival LG will be showing a 15in OLED display at the IFA show, opening this week in Berlin, and plans to produce much larger screens by 2012. Speaking to reporters in Seoul, LG Display CEO Kwon Young-soo said that the company plans to produce 30in screens using the organic LED technology in the next couple of years, in an effort to open up a new source of revenue. That's a clear jab at Korean rival Samsung, which last month launched a mobile phone with an OLED display in the domestic market. Samsung is the world's leading flatscreen manufacturer, with LG in second place. LG Display says it plans to invest heavily in OLED research, taking on around 1700 new staff this year, and that it has swung back into profit in the last quarter, benefiting from the high demand and rising prices in the LCD panel market. The company will be investing 3.27tn won, or around £1.6bn, in a further eighth-generation LCD production line, due onstream by the second half of next year.